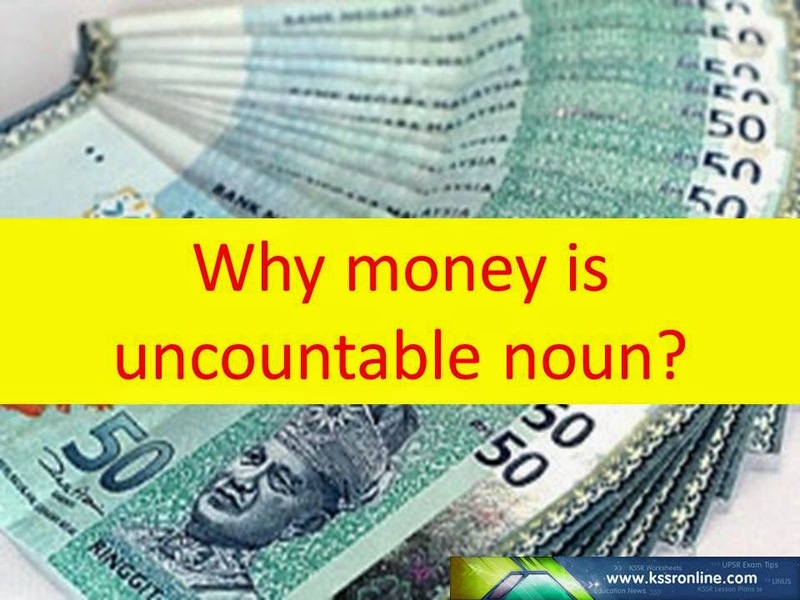 kssronline.net - KSSR, DSKP, UPSR, LINUS: GRAMMAR: Why money is UNCOUNTABLE ? GRAMMAR: Why money is UNCOUNTABLE ? WHY 'MONEY' IS UNCOUNTABLE NOUN? Yesterday, I was teaching about countable nouns and uncountable nouns. My students came across this question. Just in case you don't know, this might be helpful to you. Student asked, "Teacher why money is uncountable noun since we can count it?" 'Money' is an uncountable noun. This is because we cannot say, "1 money, 2 money, etc." When we say we count money we mean that we count currency which is the measurement for money. Therefore, 'ringgit' makes money countable, so 'ringgit' is a countable noun, but not the 'money'.